Ailanthus altissima is a tree to 20 m tall, dioecious; clonal from root sprouts, roots near trunk form thick storage structures, bark smooth, pale gray-brown; branches few, stout, twigs more or less 1 cm wide, with large brown pith, marked with large, shield-shaped leaf scars about 1 cm wide, winter bud low, dome-shaped, scales overlaping, inserted into upper edge of leaf scar, vein scars numerous in a necklace-arrangement along inner margin of leaf scar (Harlow 1946, Gargiullo personal observation); very fast growing, can grow up to 2.5 m per year (Petrides 1988) Growth rate 3.32 (relative to 9.24 for B. populifolia and 0.99 for sugar maple). Growth rate was found to correlate well with relative shade tolerance (Grime 1965). Ailanthus altissima, twig-close-up_winter_leaf_scar. bud,I_SB17536. © Copyright Steve Baskauf, 2002-2011. discoverlife.org (Accessed 7/2017). Leaves alternate, large to 1 m long, odd pinnate-compound, 11-41 leaflets, often with two large teeth near base, each with a gland below, foul smelling when crushed, leaves expand mid-May, later than most other trees; winter dormancy 184 days (Britton 1874), drops leaves in early fall. 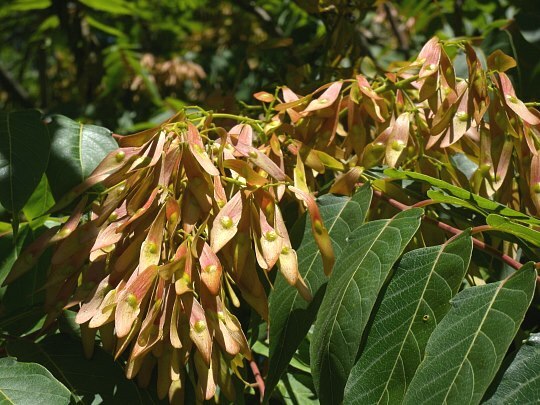 Flowers with sexes on separate plants, greenish, small, in dense clusters, May-July, flowers on male trees foul-smelling, more conspicuous than female flowers, attractive to insects, insect pollinated. Ailanthus altissima mature fruit.Woody Plants. Wikidot. woodyplants.wdfiles.com (Accessed 7/2017). 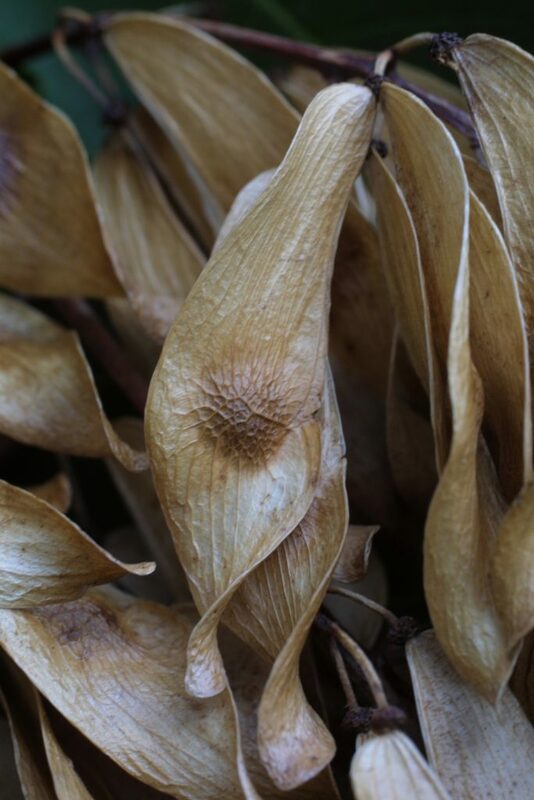 Fruit dry, flat, on female trees only, winged samaras 3-5 cm long turning reddish, ripen Sept.-Oct., wind dispersed through winter, eaten by some birds, and by white-footed mice (Peromyscus leucopus) (Ostfeld et al. 1997), seedlings eaten by meadow voles (Microtus pennsylvanicus) (Ostfeld et al. 1997). Frequency in New York City: Very common. 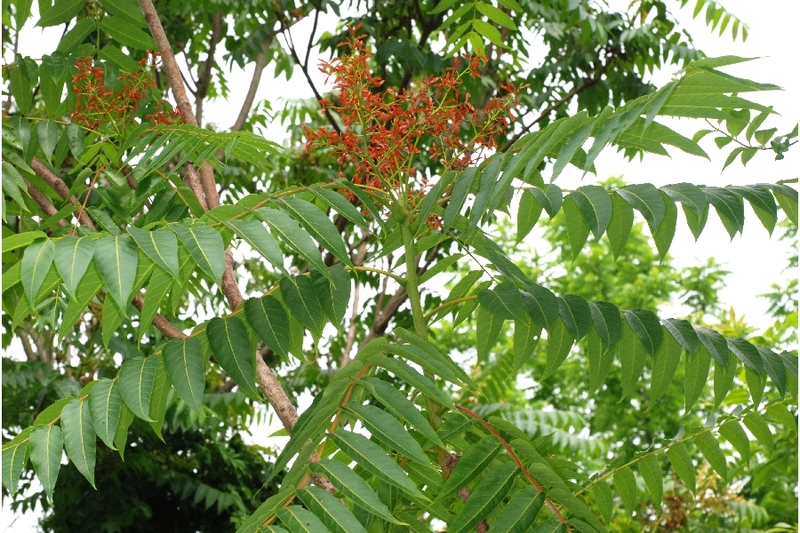 Ailanthus altissima (Tree-of-heaven). bark. John Hilty. tr_heaven3. Illinois Wildflowers. illinoiswildflowers.info (Accessed 7/2017). Habitat: Disturbed areas, on fill, waste areas, roadsides, forest gaps, wetland edges to uplands. Root sprouts and seedlings quite shade tolerant (personal observation), a pioneer species, fast growing, aggressive, in Tolerates acid soil 4.1-7.9 (USDA, NRCS 2010). In NYC found on soil with pH 4.3 (Gargiullo, unpublished data). Indifferent to soil type, sandy to clay. Able to germinate and grow in forest gaps with as little as 2% full sunlight availability (Knapp and Canham 2000). Allelopathic compound in bark and leaf litter toxic to many other trees excepting white ash (Fraxinus americana) (Mergen 1959; Young 1996) toxin levels highest in young foliage (Hoshovsky 1995). Ubiquitous exotic pest, displacing native trees. Tolerant of salt. Ailanthus altissima (Tree-of-heaven) immature fruit. John Hity. Illinois Wildflowers. illinoiswildflowers.info (Accessed 7/2017). Notes: Damaged by a few insects and fungi (Burns & Honkala 1990). 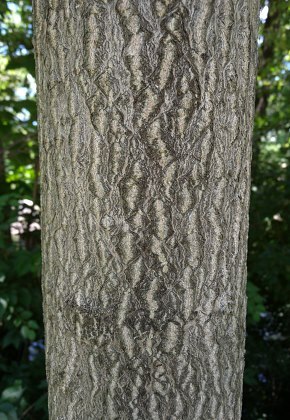 A fungus that kills Ailanthus has been identified as Verticillium dahliae (T. Emmerich, personal communication). 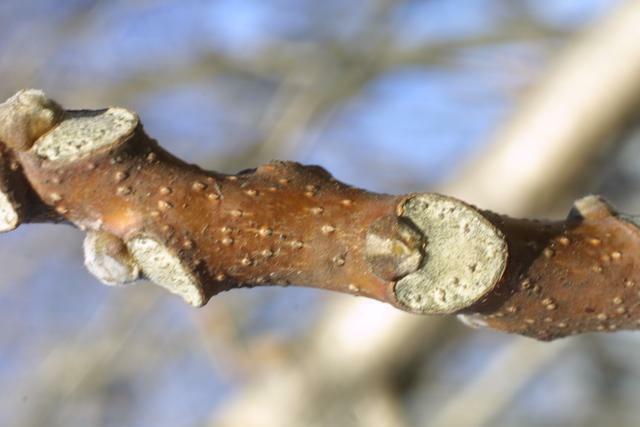 Wounded or stressed trees can be infected by a number of opportunistic fungi such as Botryosphaeria sp., Ganoderma applanatum, and Nectria cinnabarina. 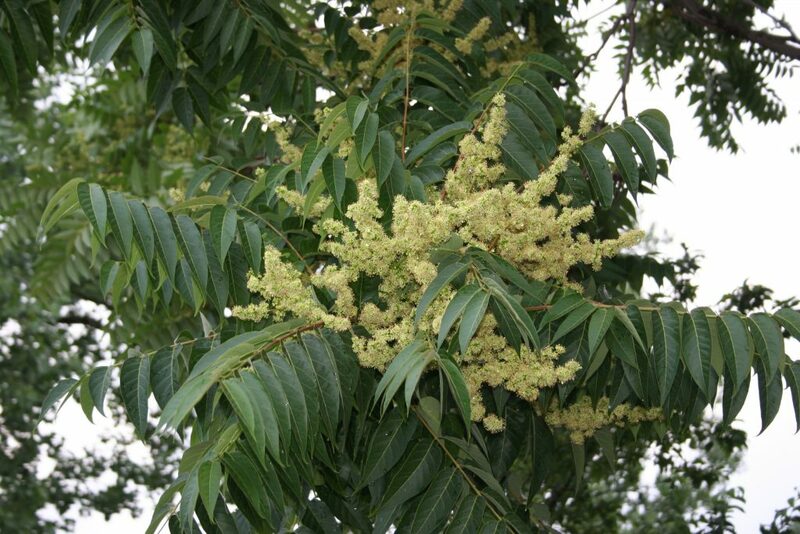 Leaves are eaten by Atteva punctella, the Ailanthus web worm, which can occasionally defoliate entire trees. This moth has orange wings with four bands of yellow spots ringed with black. The larvae live in communal webs and are most common in late summer. They are olive-brown with five white, longitudinal lines (Covell 1984; Johnson and Lyon 1991; Sinclair et al. 1987).